Thirteen gold commemorative coins were released by the United States Mint between 1903 and 1926, ranging in denominations from one dollar to fifty dollars. These were sometimes released in conjunction with a commemorative silver dollar, but occasionally featured another subject altogether, as was the case with the first two gold commemorative issues, the 1903 Louisiana Purchase gold dollars. The United States first struck a gold dollar in 1849, following the discovery of gold in California. Over the years, the denomination ceased to be used except in remote areas of the country, and by the 1880s mintages had dropped considerably. The denomination ceased to be struck in 1889 and at the time few thought another gold dollar would ever be produced. This changed in the early 20th century when numismatist and entrepreneur Farran Zerbe emerged as the brainchild behind two commemorative gold dollars struck in conjunction with the Louisiana Purchase Exposition, held in St. Louis in 1904. The act of June 28, 1902, authorized a maximum mintage of 250,000 pieces — 125,000 of each variety. The coins were to feature Thomas Jefferson and William McKinley, who was assassinated during his presidency in September of 1901 at the Pan-American Exposition in Buffalo, New York. 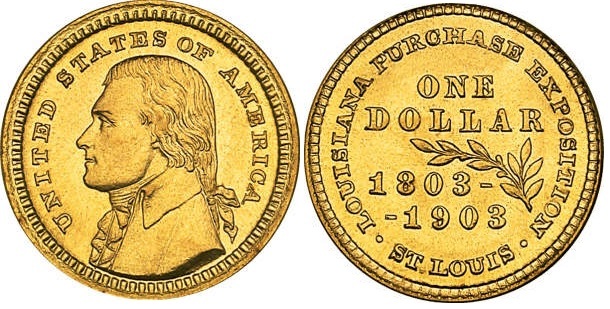 The two gold dollars were designed by Charles E. Barber, with the assistance of George T. Morgan. The obverse of the Louisiana Purchase, McKinley gold dollar (not to be confused with two gold dollars commemorating McKinley struck in 1916 and 1917) featured the left-facing bust of the 25th President of the United States, William McKinley, who served from 1897-1901. McKinley was born in Niles, Ohio, on January 29, 1843, and would be the last American president to have served in the Civil War. Barber copied the bust of McKinley from a presidential medal Barber had designed himself. Around the bust is UNITED STATES OF AMERICA. The reverse features an olive branch, with the dual dates, 1803-1903, below it. Near the bottom is ST. LOUIS. LOUISIANA PURCHASE EXPOSITION is seen around the coin along the rim, and above the olive branch is ONE DOLLAR. Unlike most other American coins, its reverse (both the Jefferson and McKinley varieties share the same reverse) lacks the mottos IN GOD WE TRUST and E PLURIBUS UNUM. The Jefferson variety was also designed by Charles Barber. It shows Jefferson facing left as well, copied from an early 19th century medal by Chief Engraver John Reich. Thomas Jefferson engineered the Louisiana Purchase, through which the U.S. acquired 828,000 square miles of territory in the Midwestern and Western United States from France for a total sum of 15 million dollars. The territory stretched from New Orleans to the Canadian Rookies, and almost doubled the territory of the country at the time. It would lay the basis for the westward expansion of the United States until the country stretched from coast to coast. The first coins were struck as early as December 1902 (though dated 1903) at the Philadelphia Mint, and by January of 1903 the Mint had produced 125,000 coins of each variety as stipulated in the authorizing act; it is unknown which variety was produced first. The coins were to be distributed by the Louisiana Purchase Exposition Company, led by Farran Zerbe. Offered at three times face value, or $3 each, sales were lackluster at best. Zerbe at hoped that he would be able to sell the coins at that large of a premium over face value because older gold dollars also traded at a premium, but these hopes were in vain. With sales moving slowly, organizers tried numerous things to increase attention to the issue. These included highlighting various items of jewelry into which the commemoratives could be set. Luckily for collectors, sales of these pieces were slow as well, and a relatively small number of surviving pieces will show damage from having been once set in these jewelry pieces. Sales remained lackluster and in 1914 an incredible 215,000 pieces of this issue were returned to the Philadelphia Mint to be melted. It is unknown how many of each variety were included, but most sources estimate that the total was roughly even for each variety. This means that both varieties have a net mintage of approximately 17,375 pieces each, according to most reference works. Judging by the overall availability of both varieties this seems to be accurate. Despite posting a much lower net mintage than had originally been anticipated, both varieties are readily available in most grades up to MS-65. Even pieces grading higher than that are relatively available, but are obviously much in demand from type- and gold-collectors. In the highest grades the McKinley variety is far more available than the Jefferson variety, but the difference is minimal. A relatively high number of Proofs (100 of each variety) were also struck, which is uncommon in the world of classic commemoratives. They were produced for government officials and those with inside connections to the Mint, and were not available to collectors at the time. The coins were carefully placed in an imprinted card, signed by Superintendent J.M. Landis and Coiner R.R. Freed of the Philadelphia Mint and wax sealed. Original sealed cards are very rare, as many have had the Proofs removed or the seal tampered with, and some have even been reported with the Proof coin replaced for an ordinary, proof-like business strike. Interesting, who owns the thirteen coins now?